The Shutdown: Where’s the Outrage? As the shutdown of the federal government continues, I can’t help notice how silent average Nutmeggers and Americans have been about it. Sure, there has been no shortage of comments on social media, but no demonstrations, a part of American culture dating back to the 1700s. Maybe Facebook and Twitter have replaced megaphones and placards. Remember the scene above? 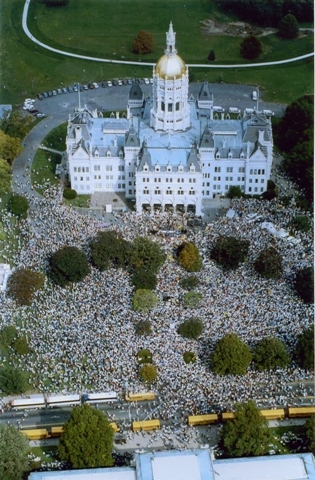 That was 22 years ago this weekend at the State Capitol. An estimated 50,000 people turned out at to protest the state’s newly passed income tax. Any way you look at it, this was an amazing turnout. We’ve pulled some vintage video out of the Channel 3 archives from October 5th, 1991 featuring Lowell Weicker, John Larson, Tom Scott, John Rowland, Miles Rapaport, Jonathan Pelto, Brad Davis, and others. There are also two women we cannot identify. If you know who they are, let us know. Outrage? Indignation? Try living in my world. My son, an IEF/ CTANG veteran is dependent on the VA and federal government to do their thing. He has a hearing scheduled for the end of October that took him almost 3 years to get. The VA rep told him over the phone that his appointment might get cancelled because although the VA is unaffected, the Comp&Pen office is. Add to this, he gets food stamps & some assistance from DSS and his hearing for SSA was cancelled because the staff in that office was furloughed!! AND with all of these appointments getting pushed back, there is no guarantee of retro-activity. Who is going to take care of these bills? Oh and I just found out WIC might be out of their funds before the end of the month. Has anyone seen the price of formula? Energy assistance began 10/1. Appointments are being granted. But wait, some of the paperwork he needs is through SSA and he can’t get that so they go to that appointment hoping someone understands the situation. It just keeps getting better and better. So I heard Our Senators are turning over their paychecks. But here’s my big question: Why are they getting them in the first place? Since the government is shut down shouldn’t their pay stop until this is resolved? It’s one thing for a wealthy person to say he doesn’t need his pay check, but what about those that do? Most people live pay check to pay check as it is. I would like to see the Congressional delegation live for the month of October with the very same issue. What’s next and where is THAT money coming from? We (the public) didn’t hear about a our government going broke, or shutting down until a Black Man became President! This Country (USA) was in worst shape with George Bush jr. The House of Congress doesn’t want too implement any Programs by a Black President Good or Bad!! Of course, it is always about race. This country was under bad shape with Bush, but it has gotten worse under Obama. Bush left with an unacceptable $300B a year in deficits. Obama is around $1T. Spending has skyrockted under him, starting in 2009 when Democrats controlled Congress (with 60 votes in the Senate). No budget has been passed since then. The Republicans have not done enough, but they have done something. The Senate, controlled by Democrats, have not passed a budget and refuse to. It has nothing to do with race and everything to do with the incompetence of Obama. I highly doubt that. Although I bet Martin Luther King Jr. would object to the things that have been going on, similarly to other who don’t have their head up their rear end. This shutdown has nothing to do with a black man being the president. Maybe you might not remember but the government shut down in 95′ for a total of 28 days, and guess what. The president was a white man (Bill Clinton). Brenda, I agree! Gop’s main concern is that THIS President fails! I am so fed up with this congress..TIME to make a change in 2014 – ! Thats the most ignorant rant I’ve read. They don’t want to impose it because it’s a horrible plan, black, white purple, it doesn’t matter. GW Bush was just as bad so I can’t disagree with that. Who controlled Congress totally after the 2006 election? The Democrats, and the economy didn’t tank until late in 2008, but it’s Bush’s fault. By the way, what is the House of Congress? Learn something about how your government works, before you show to us what a “low information voter” you really are. I was right there on the front steps with 15 of my friends yelling “repeal” with the rest of the crowd. I don’t think we are being “unpatriotic” per se; I think we are bit tired. Tired of the smack which is spewed to get re-elected; tired of our elected officials not checking their egos at the door as they “go to work for us;” tired of our voices not being heard over the din of their infighting. I’m ashamed it has come to this. This is the United States of America. When our Forefather’s fought for us, I really don’t feel they had this bunk in mind. My opinion. I can only speak for myself. Brenda there have been numerous close calls over the years and a big one 17 years ago. This is Congress. Not the president. People today expect the government to be self serving. They expect the politician to have tunnel vision for their personal causes and deny the American people a voice. The American people feel they are on mute, they have been complaining for many years but this falls on deaf ears. There is no point in getting mad because they do not pay attention or do not care. This government (state and federal) have beat us down and we are tired. I love this country but not the way it is run. I would also like to reply to Brenda Pitypat Slayton….The information you posted was not accurate so I thought I should let you know that when Bill Clinton was president there were 2 government shutdowns and 1 of them lasted 3 weeks. There were also quite a few partial shutdowns during the Ford, Carter, and Reagan terms and a very short shutdown during the George H Bush years. It would have nothing to do with the color of the president either. I put this shutdown more on the backs of our House and Senate (both republicans and democrats) because they are using the American people to further their own agendas. I have gotten to the point that I do not know which party to stand with because they both make me cringe. Hopefully they can finally get it together and learn how to better negotiate for the American people. Thank you thank you. Congress is using us to get back the president. Since Congressmen have their own health insurance, they have no idea what it’s like to be without it. Try being sick and not going for help because of the cost. They know what this is doing, they just don’t care because of their own agendas. Insurance is to high It is unaffordable.and deductions are outrageous!!!!!!!!!!!!!!! And George Bush jr was just as as bad. I loved Bill Clinton When he was eating steak so were we.!!!!!!!!!!!!!! There’s no outrage because for the first time, in a long time, the government isn’t controlling us! Obamacare needs to be de funded or changed, they need to remove the mandate and taxes on med equipment. This shutdown is really a very old issue. This is all about a continuing budget resolution which should have never been required in the first place. The only reason for the resolution is the lack of a budget. Since President Obama was initially elected we have not had a budget. Even when his Democratic Party had a majority in both the House and Senate they refused to pass a budget. In fact every member of the House from both parties voted against the President’s proposed budget. Indeed it is outrageous that our federal government runs without a budget, something no state or local government can do. In the real world, if a CEO or President ran the company without a budget they would be considered irresponsible. It is outrageous that we have allowed this by continuing to vote for incumbents that allowed this irresponsibility to grow like a cancer within our federal government. If you wonder how I really feel, I am outraged. yes tI totaly agree that the president has anything to do about this stupid idioctic shutdown its both the democrats,republicans CONGRESS,that are trying to prove to themselves whatever!!!!!!!!!!!!!!!!!!!!!!!!!!!! who cares what color he is. I just wish he loved his Country. He is a communist no one wants to be controlled by the Government. And then he Threaten’s us with the IRS. this is communist. President Obama does what ever he wants and when he wants And Dosent listen or compromise with the American People!!!!!!! Blackman or Whiteman no longer matters the fact is black, white, brown and yellow men, women and children are suffering. It’s more about the have and the have nots unfortunately a great many of those who have not are Black Americans, do the research not the agreement. Obama has done little for the poor and less for Black, African Americans whichever we are calling ourselves these day. True congress is of no help either who do i blame, i blame those of use who would rather stand about complaining verse doing their homework regarding what they can do to bring about a positive change. If you don’t like what your congress person is doing VOTE, if you don’t like the president VOTE and make sure young people, minorities and your seniors can VOTE. Help them with the information they will need to make informed decisions for themselves. Many of us base our views on the views of what others have told us. Not from information based on the available FACTs everything you hear or think you hear is not true. If we could/would stop fighting each other and take a stand for a positive change things could/would change. Most of us would rather point figures verses having fingers pointed us for stating the FACTs. Understand that FACTs aren’t always TRUTH they are just FACTs, TRUTH is based on how you formulate the FACTs. Let’s get something perfectly clear . . Obama is BIRACIAL! Not black nor white but both!!!! And this financial mess started way before “the black man” became president. We are going into a debt that was started when BUSH declared war! Whomever was going to be president was left an hell of a mess that NO ONE will be able to clean for a long time. Come on America , , , get over the race card. It sounds soooo ignorant! Karla. I totally agree with you. Our system (should I say if we even have one) is flawed to say the least. One can go back and see how each former President made bad decisions. There is no point in that. There are a couple things that bother me. This war should be over by now; bring our troops home. AND we (USA) need to mind our own business and pick our battles. We bail everyone out and we wonder why there is no money left. Charity begins at home. Take care of the American people, and fix our own problems. One last thing. I think I heard Oprah say this or she repeated what someone else said. We as an American people have no clue what we have unwittingly co-signed on behalf of our leaders. We are hated by many. I remember after Bush hit the red button that the other countries were “stunned” to find out American people pray. I am ashamed right now. We are better than this. Good riddance to the feds. They’re too big. It’s just too bad that it’ll be status quo when they’re done, instead of trimming the fat, starting with the dictator who masquerades as our president. It’s sad that we have to pay ridiculous amounts of money in taxes while people like him take lavish vacations on our dime. It’s too bad that people forget that they can be self-sufficient after so much welfare mentality has been injected into us. Kudos to the few in those rooms who are standing against this. As for protests, they don’t matter. Just look at how the 2nd amendment was trampled, even though it’s against both fed & state constitutions. Anyone who was at or watched those hearings knows that 99.9% of the people who testified were dead against their knee-jerk, feel-good laws. And why exactly is it that they want to disarm us anyways…hmm? It is obvious that all of you on here in support of the Affordable Care Act know nothing about insurance and how it works and have not actually taken a look at the subsidy calculator or actual plans and believe the lie that this program will help anyone except those already receiving substantial resources (phones, food, direct assistance, housing assistance, utility assistance) and those with pre-existing conditions. This program will be an extreme hardship on young people currently struggling to establish themselves in a nonexistent job market and on middle class families facing similar challenges and trying to raise children while their earnings stagnate and the cost of living continues to rise. Please do your homework before you flap your jaws.